GALION — Learning to give back to their community and help others is a fixture in the educational environment for students in the Galion City School District. Galion Intermediate School fifth-grade teachers and students will conduct their fifth annual “Socktober” fundraiser Oct. 1 through Oct. 31. Ms. Prince is giving her students the opportunity to lead this year’s event, and they have taken the challenge to heart. The fundraiser will include all classes at the Galion Intermediate School again this year. Fifth grade students Kylee Crager, Allyssa Woodmansee, and Cadie Marsh presented, and received approval for, an incentive from Intermediate School Principal Alex Sharick for students who participate and donate to Socktober. Students who donate one pair of socks each week can wear jeans each Friday, and students who donate two or more pairs of socks each week can wear jeans and shirt of their choice. Dates when students can wear jeans and shirts of their choice are as follows: Oct. 5, Oct. 12, Oct. 19, Oct. 26. Prince’s students have set this year’s goal very high. They are working to collect over 1,000 pairs of new socks to donate to the local homeless shelter. Please contact Paula Prince at 419-468-3676 or email prince.paula@galionschools.org for more information about the “Socktober” fundraiser. 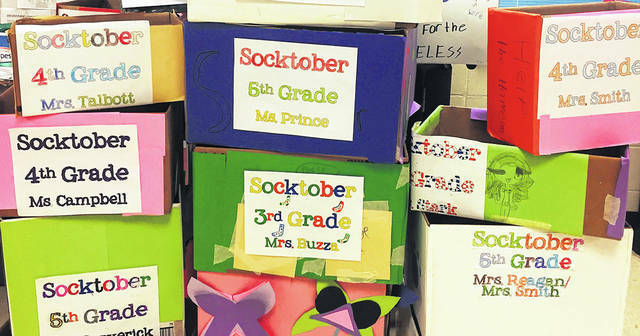 Students in Ms. Paula Prince’s fifth-grade class at Galion Intermediate School have been busy preparing for the kickoff of the annual “Socktober” fundraiser Monday, Oct. 1.